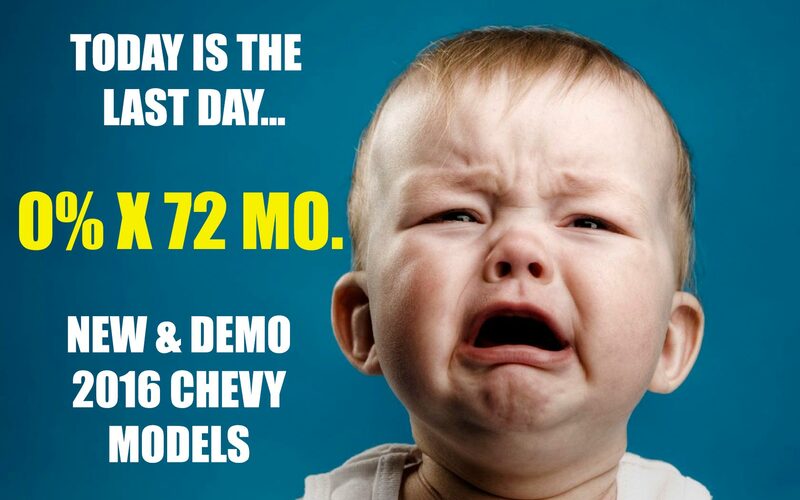 Don’t Cry…0% X 72 Months Ends Today but You Can Still SAVE at Ron Westphal Chevrolet in Aurora, IL. 0% X 72 Months Ends Today at Ron Westphal Chevrolet in Aurora,IL. Hurry. 0% apr x 72 mo. financing is available on all remaining new and demo 2016 Chevrolet models…until 9pm tonight. Ron Westphal Chevrolet is located in Aurora, IL on the corner of Routes 30 and 34. We are 5 minutes away from Plainfield and Naperville. Located in Kendall County, many people travel to our dealership from Joliet, Elburn, Bolingbrook and Oswego along with Yorkville, Sugar Grove and Chicago, IL.